Breakfast during the week for me lately has either been slow cooked oatmeal or toast with avocado or a nut butter of sorts on top. But come weekend I give myself free reign to enjoy eggy creations, salty meats, or sweet treats. Or, perhaps, it is a concoction involving all three and then some. The latest incarnation was everything a perfect breakfast should be: savory, sweet, fluffy, crunchy, bready, meaty and completely off-the-cuff. I was at the tail end of some sprouted wheat bread that I thought tasted good but had a really odd, almost spongy texture. I have been reluctantly chewing (and chewing and chewing) through it but thought it might be better as a french toast. We also had about four delicate slices of pancetta and two slices of ham, an end nub of colby jack and an ear of corn. All that sounded like it would go well together and I settled on making more of a strata style egg mixture than a sweet one. Four eggs were blended with 1/4 cup of milk, a teaspoon or so of dry mustard, a pinch of dry thyme, salt and pepper. I soaked four slices of bread in the egg mixture while I browned the pancetta. I then cut the corn off the cob and quickly browned it in some butter and set it aside. The ham was cut into thin strips, browned briefly, then in went about two tablespoons of maple syrup which I cooked until the ham was nice and glazed. The bread was cooked in the pancetta pan, then flipped. I took two out and sprinkled half the grated cheese in the pan and put the remaining two slices on top cooking until the cheese was crisped on the bottom. I also poured in a little of the remaining egg mixture. I repeated that for the other two pieces. Once assembled it looked amazing and there was just enough of every taste to ensure a perfect bite every time. A little side salad or some fresh greenery of sorts would be a welcome addition, but overall this was Saturday morning perfection. 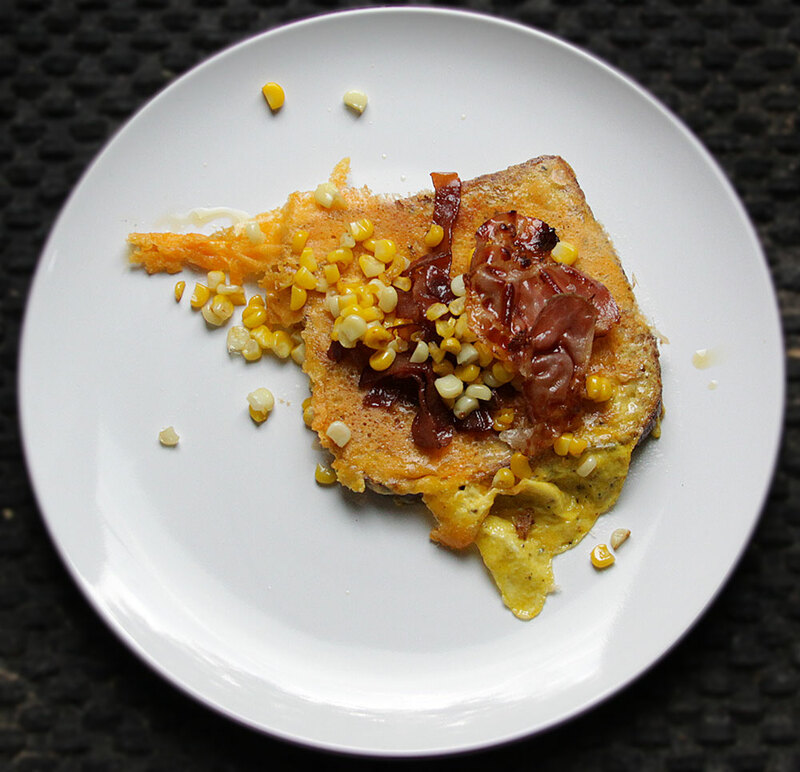 This entry was posted in Breakfast, Eggs, Leftovers by Marina Chotzinoff. Bookmark the permalink.